My oldest daughter isn’t sleeping well. It’s the dark. From fear of what might be under her bed, to who might be looking through her window, she has her reasons for preferring the lights on. In fact, she has started a new nightly routine. After the house is settled and her parents are quiet, presumably asleep, she secretly slips out of her room to flip on the nearby hallway light and then returns to bed. Somehow she finds a measure of comfort from the crease of light between the floor and the bottom of her door. But she shouldn’t be doing this. The rule is to stay in bed. And a few nights ago I caught her red-handed. I was standing quietly in the dark hall and heard her scurrying around behind her door. She didn’t know I was there, and I suspected she was going to pull the hall light stunt. Sure enough, the door slowly cracked open. I have her, I thought. But she didn’t move. She didn’t come turn on the light. She was frozen. There, inside the frame of her door, she peered in silence at me, a black silhouette of a stranger for all she knew. Then she started to cry. I quickly flipped the light switch. “Sweetie, it’s me,” I said, picking her up in my arms. And just like that, she was fine. The light was on. She saw who I was. I hugged her with love. The whole scene transformed when the light came on. That light uncovered my identity. Once blinded by darkness, she soon discovered that the figure in the hallway, appearing bigger and stronger than her, was actually her dad who loves her and would spend his every conceivable resource to protect her. Revelation was the key. She had to see who I was. Do you remember what it is like to be in the dark with God? 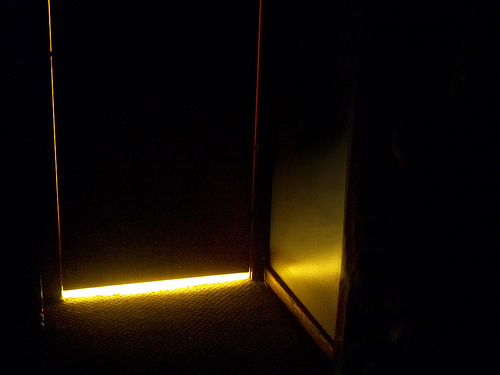 So much of our lives — and the entire lives of some — are spent hauntingly aware of some strange presence down a pitch-black hallway. We know he is there. We recognize some silhouette of deity. We see some figure of a being our conscience says is bigger and stronger. But we don’t truly know him. And we won’t truly know him unless he turns on the light. Unless he reveals himself. The prophets of Baal know what it’s like to be in the dark. In one of the saddest scenes in all of Scripture, 1 Kings 18:28–29, hundreds of these prophets gathered to see their god. It was a historic showdown between Elijah, the Lord’s prophet, and 450 “spokesmen” for the false god Baal. The petition was simple: send fire from heaven. Whoever answers is the true God (1 Kings 18:24). And so the prophets of Baal stepped up to the plate. That’s not a good start. So they tried harder. The Bible tells us that they cried aloud and cut themselves with swords and lances until the blood gushed out (1 Kings 18:28). Until the middle of the day, they limped around bleeding and crying out for their god to hear them, to say something. Imagine that scene: 450 wounded, weeping prophets sliced up their flesh in hopes of receiving the slightest gesture from their god. “But there was no voice. No one answered; no one paid attention” (1 Kings 18:29). They were stuck in the dark. There was nothing to see. There is no light to reveal a no-god. The abiding darkness answers itself. But there’s no such darkness between the Christian and his Lord. That’s not our story. In fact, it’s the reverse. Rather than 450 prophets with wounds all over their bodies and their blood gushing out, we see our God hanging on a cross with wounds all over his body, his blood gushing out. Rather than the horrific scene of fools seeking to hear from a false god, we see the most preeminent display of love when the real God spoke to a world of fools. We were in the dark. We deserved nothing more. And then, in unspeakable grace, the sovereign God of the universe reached up to turn on the light. God shows his love for us in that while we were still sinners, Christ died for us. (Romans 5:8). His voice intruded the defeated darkness. He reached down and picked us up in his arms. “It’s me,” he said. And then we learn that this God, bigger and stronger than we could ever imagine, hasn’t spared his greatest resource to not only protect us but ensure our everlasting joy (Romans 8:32). The light is on. We see who he is. We don’t have to be afraid. Have courage for the great sorrows, and patience for the small ones. And when you have laboriously done your tasks, go to sleep in peace. God is awake.